At a time when natural history museums are moving away from taxidermy, there has been a resurgence of interest in popular culture—in Internet blogs and image collections, in fashion, home décor, and advertising—as well as in art practice. Dead Animals, or the curious occurrence of taxidermy in contemporary art surveys current artistic use of taxidermy through the work of eighteen artists: Maurizio Cattelan, Kate Clark, Mark Dion, Nicholas Galanin, Thomas Grünfeld, Damien Hirst, Karen Knorr, Annette Messager, Polly Morgan, Deborah Sengl, Angela Singer, Bryndis Snæbjörnsdóttir/Mark Wilson, Richard Barnes, Jules Greenberg, Sarah Cusimano Miles, Richard Ross, and Hiroshi Sugimoto. Taxidermy animals are extraordinary animal-things. As Rachel Poliquin—author of the cultural history The Breathless Zoo: Taxidermy and the Culture of Longing—affirms, “at once likelike yet dead, both a human-made representation of a species and a presentation of a particular animal skin.” The exhibition and accompanying symposium will examine the cultural history of taxidermy, social factors that have contributed to artists’ interests in the “idea of the animal,” and the ways in which these interests are manifest in artists’ works. It will question how taxidermy, with its inherent association with death, differs from the use of live animals or animal substitutes such as stuffed animals, and why taxidermy may be particularly relevant to the exploration of the human-animal question. Finally, it will examine ethical issues surrounding the incorporation of animals in art. The exhibition is organized around four prevalent themes that draw particular strength from taxidermy—in which the fact that the animal is real and dead imparts meaning. The themes are death (both human and animal); hybrids—both animal-and-animal and animal-and-human; animal-human relations (humanity’s treatment of and effect upon nonhuman animals); and, within photographic artworks, taxidermy’s display in natural history museums. 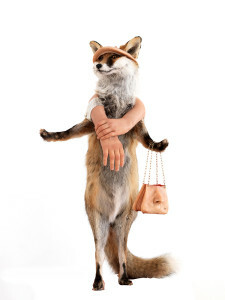 Taxidermist and artist Polly Morgan works against the traditional goals of taxidermy. Rather than a lively depiction, she presents animals in death. Gannet, 2014, is a momento mori. The large and beautiful bird falls limply over the edge of a black frame—in a pose that is synonymous with death. The frame houses a drawing of a bird’s nest created from the ashes of cremated birds. German artist Thomas Grünfeld explores animal hybridity in his Misfits. What if you could breed a flamingo and a mastiff, a rooster and a donkey, or, as in the work is this exhibition, a penguin and a peacock. Grünfeld’s finely crafted animal specimens befuddle and amuse. Denying any concerns for genetic engineering or cloning, Grünfeld views his works instead as a “possible and thinkable alternative to God’s creation.” Expressing an interest in the commonality of humans and animals, Kate Clark creates stunning hybrid creatures with animal bodies—antelopes, bears, monkeys, and the like—and human faces, clearly recognizable and individualized portraits. A number of artists in the exhibition react to human treatment of animals and the environment. Reflecting on the Victorian and colonial roots of taxidermy, the artistic collaborators Snæbjörnsdóttir and Wilson have created an archive of extant taxidermied polar bears in the United Kingdom. Photographing each bear where it was found—in circuses, museums, trophy rooms, and domestic settings—they combine the photos with a textual history of the animals’ “second life,” the details of how, when, and where they were captured, who stuffed them, and where they have resided since. They wittily call the series Nanoq: flatout and bluesome. New Zealand artist, and animal-activist, Angela Singer rails against trophy hunting. Pulling no punches, her latest work entitled Spurts, 2015, depicts a decapitated deer, with cartoony, yet still gruesome, bubble-gum pink “blood” spurting from it neck. Mark Dion’s Concrete Jungle is not a grimy, crime-ridden city from film noir, but rather the detritus of our contemporary consumer culture—a pile of discards and garbage in which animals attempt to survive. Support for Dead Animals, and associated programs is provided by Brown’s Creative Art Council Arts Initiative and the Steven & Alexandra Cohen Foundation, and the Marshall Woods Fine Art Lectureship.